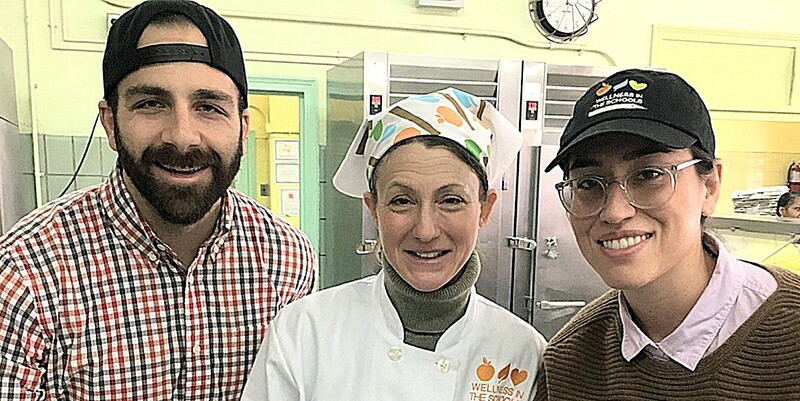 How to prepare healthy afterschool snacks was the lesson of the day when Between the Bread’s Jon Eisen and Victoria Rolandelli recently visited PS 87 on the Upper West Side. As part of Wellness In The School’s Cook For Kids Program, they threw on their aprons and had a food tasting for over 700 K-5th graders. The menu consisted of homemade purple potato chips, pickled watermelon radishes, and a strawberry banana smoothie to wash it all down. “It was great fun showing the students how to create these simple snacks. And we were able to explain to the kids that these snacks not only taste great – they are healthier than store-bought potato chips and caffeinated sports drinks,” said Eisen. Between The Bread is a partner with Wellness In The Schools, a non-profit that inspires healthy eating, environmental awareness and fitness as a way of life for kids in public schools. The students had a great time and, ever since BTB’s visit, students, parents and teachers alike have been asking us for the snack recipes, so we’ve decided to post them here so everybody can try them out. Note: You can also add some almond butter for a bit more thickening and sweetness. Coat slices in a dash of vegetable or olive oil and sea salt. Place all ingredients except for mustard seed into a bowl and whisk thoroughly until liquid turnscloudy. Repeat two more times until liquid is almost clear. Fill a glass jar or any sort of clear sealed container, with the radishes and mustard seeds. Add liquid mixture to the jar, ensuring that the radishes are all fully submerged in the liquid. Seal and gently shake, then let sit refrigerated overnight. Radishes should be sweet and salty, but most importantly the radishes should be very soft,relaxed and flexible. In addition to running more cooking demos at PS 87, Between The Bread is also planning a special field trip in which the students will visit one of our eatery kitchens.